Germany’s consistent economic performance since 2010 has resulted in another decrease in business failures. In 2017 business failures decreased by 6.6%, to about 20,000 cases. 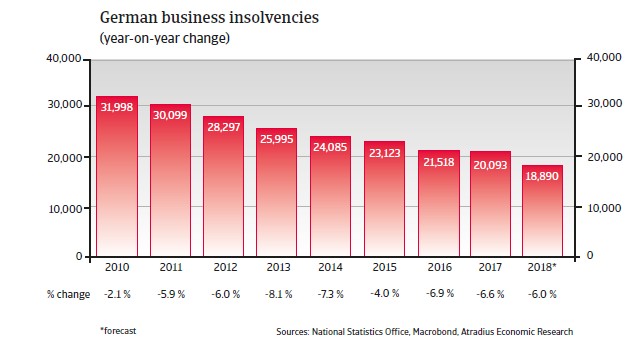 At the same time, creditors´ outstanding claims increased to EUR 29.7 billion in 2017 from EUR 27.4 billion in 2016, as more larger and economically relevant businesses failed in 2017. The German economy remains resilient, with a solid growth rate of 2.4% forecast for 2018. 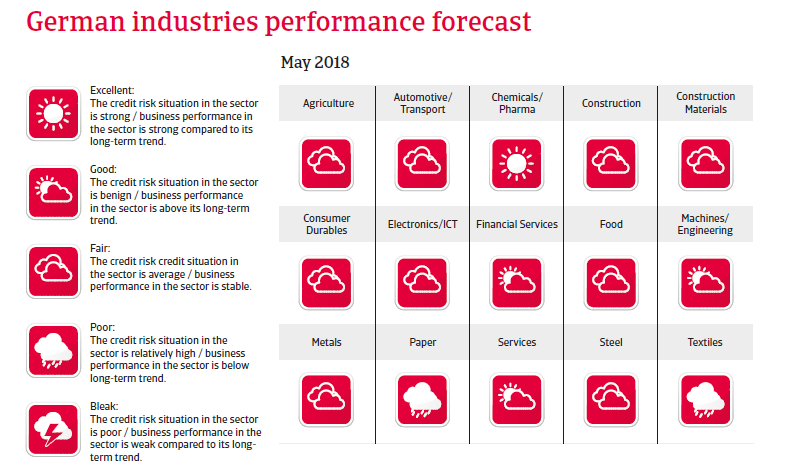 The economic expansion remains broad-based, driven by private consumption and business investments, while export growth is sustained by the eurozone demand. Both consumer and business sentiment are high, while credit growth remains solid. However, the appreciation of the euro is slowly turning into a headwind for export growth to destinations outside of the eurozone. The uncertainty over the outcome of the Brexit negotiations casts a shadow, as the United Kingdom is Germany´s third largest export market. Any disruptions of global trade caused by protectionist measures (e.g. triggered by US economic policy shifts) would also pose a downside risk for the German economy. The federal government has achieved slight budget surpluses since 2015, largely due to higher tax revenues and lower government transfer payments for unemployment. In 2018 and 2019 the budget surplus is expected to be maintained. As food processors and retailers demand longer payment terms from their suppliers, a wave of longer payment terms is being created along the supply chain.